I wake up this morning with my mind alive and worried about everything–tasks that I forgot to write down last night, loose-end issues I can’t deal with until the work week, the important small-business nuts and bolts I’ve been trying to take care of, the ever-present question of how I turn my pottery into a living, and, dare I say?, uncharitable thoughts about a couple of people I’ve had to deal with this week (none of you, dear readers, none of you). Add to that the fact that I’m a serious hot-weather weakling, and our air-conditioned and ceiling-fanned bedroom already felt like it was 110°. Autumn, come quickly. I drag my sorry self to chores, one being to water the plants on the balcony, a joy in any weather but this. Outside, it is 208° already. But look what is there to greet me! 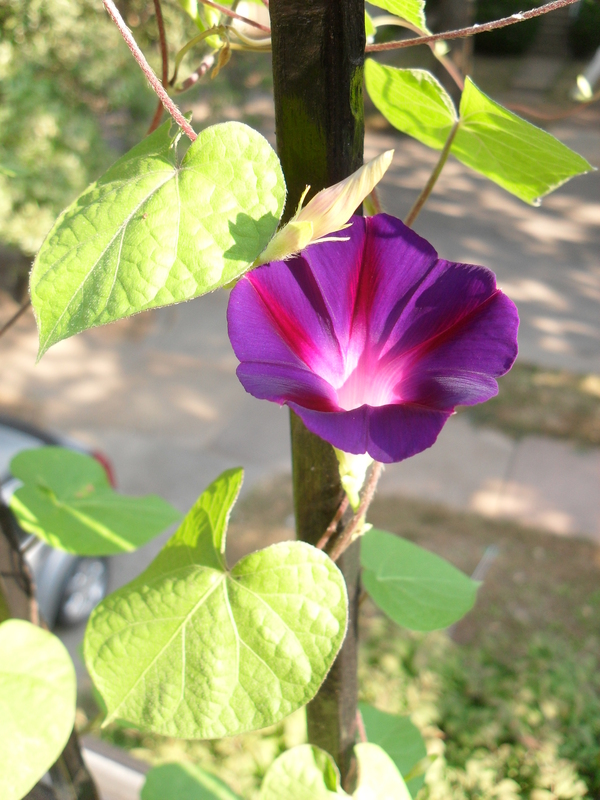 The deepest-purple, most velvety magenta-streaked white-throated little morning glory. It’s going to be a hard week of hard work leading up to next weekend’s show, but I can do it (with help), and it will be worth it. This entry was posted in Beauty, Favorite Things, Uncategorized and tagged artist, beauty, doing what you love, morning glories, motivation, self-employment. Bookmark the permalink. How beautiful. I love you, and I will be praying for you this week. Oh my! Absolutely breathtaking morning glory! This is a special gift of beauty from your Father, who loves you so much. I’ll be praying for you, too, this week, Rachel! You can do it–and do it splendidly!! I’m sure you will be blessed at the Art Faire! The mugs can wait until after OK? I know how busy you are preparing :)) I used to do juried art shows( 20 years ago) and I know what you are going through the week before. I wish I lived closer so I could be there, not working…..shopping! !